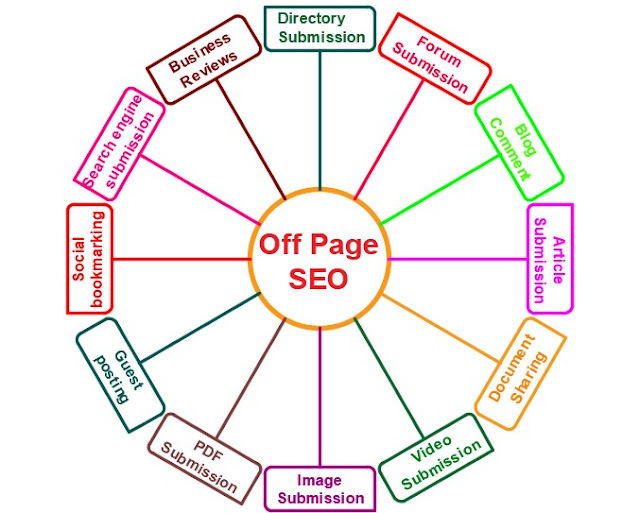 Off page SEO (is also as called Off-site SEO) is the technique it can be used to improve or increase the ranking position of a website on the search engine results page (SERP), (or) It refers to actions taken outside or away from your own website to get higher rank on search engine results pages (SERP),many people think only link building is the off page SEO and it’s enough but actually there are so many methods on off page SEO, just off page SEO methods will help enhance your site position in SERP. increasing in Ranking Position on SERP-The website will rank higher in the SERPs and this also means more traffic. To Increase in Page Rank-Page rank is the rank between 0 – 10, given by the Google for the best site in search engine result page. Higher no refers higher page rank. More exposure – Higher rankings also means more exposure because when a website ranks on the top positions of the search results page it gets more links, more visits, more visitors and more social media mentions. Directory Submission is a process of listing your site in the appropriate category or subcategory on various Directory or databases. Be sure to submit your site under the most appropriate category to take the full advantage of blog directory submission. If you continue to do this regularly, your page rank will increase and help you get more traffic from Google Search Engine. This link building will increase your domain authority. Forum Submission simply means posting new threads or replying to old ones in forums in order to get quality inbound links to a website and drive more energetic traffic to your website. If Forum Posting is done the right way, then it can drive targeted traffic to a website. Forum link building/Posting service is an SEO technique which helps in building backlinks to your website. Blog commenting is defined as a relationship between blogs, bloggers and blog readers. It is a great way to exchange ideas, thoughts or opinions about what people feel for a topic or a blog post. Blog comments are one of the easiest ways to make your blog interactive, to get backlinks on your website and to drive traffic on your blog. Effective Blog commenting strategy will make your backlinks graph grow. By commenting on a blog, you can get the backlink, but you must be careful that you are commenting on the relevant site. Don't ever comment on the irrelevant website. Blog comments help the blog to attract traffic and make it social. Increase the popularity of your website or website or website or brand. It will help you in increasing your website domain authority. If your article becomes viral then it will give you too much benefit in your business. You will get quality backlinks from the high da article submission sites. Article submissions can enhance and improve the ranking of your online business in search engines by increasing the number of backlinks and PR. Video Submission one of the effective way to increase Google Page Rank in SERP. Video has now become the most popular form of media on the web. If a picture is worth a thousand words, a video is worth a thousand pictures. Video Submission is a process of submitting your videos in video submission sites to get high-quality backlinks and drive more traffic, more visitors to your site. Also, Video submission sites are very effective in increasing website or website or website or brand awareness as well as promoting a website or website or website or brand. Image and Video submission sites have good PR, DA, and TA, it means a backlink from these sites gives your website more credibility, visibility, and organic traffic and you can rank on top pages by publishing your images and videos on these High PR websites and earn backlinks also. There are two ways in which you can make image submission. PDF submission considered as the best activity to improve the keyword ranking and get targeted traffic. You can also use it for creating backlinks from a high PR authority sites. PDF submission websites can be very useful in boosting your ranking on Google PDF submission can also be used to republish your content/article into other knowledge-based sites. You can reuse your content and create a lead magnet to attract more visitors to your site. Bookmarking is the faster way to index your site or blog post on search engines Google, Bing, Yahoo etc. Top social bookmarking sites have high PR (page rank). If you have to get backlinks from them, you will get quality backlinks. Submission to social bookmarking websites helps create new related traffic to your website. By submitting to social bookmarking sites, your website can go viral. It will improve your domain authority and reduce the bounce rate. The action of submitting a Website URL (domain name) to a search engine to create awareness of the site or page. Policies, terms, and conditions for submitting website URLs differ among various search engines. Manual submission: it involves going to “Add URL” pages of each Search engines and then filling out the form field individually. Automatic submission: it involves filling out information only one time and then software uses the following information to submit to many other search engines. But I would highly suggest manually submitting your website pages to the search engines. Business reviews are another off-page SEO Method or technique it plays an important role in off page SEO. First of all, they contribute to conversions 80% of shoppers trust online reviews as much as a personal recommendation. Positive business reviews contribute to a good website or website or website or brand awareness. They also act as powerful citations and give you the chance to take advantage of their ranking power. Putting your URL and name on a high-ranking review site like Yelp will get your website or website or website or brand to the top of search rankings for keywords you might not normally be able to compete for.